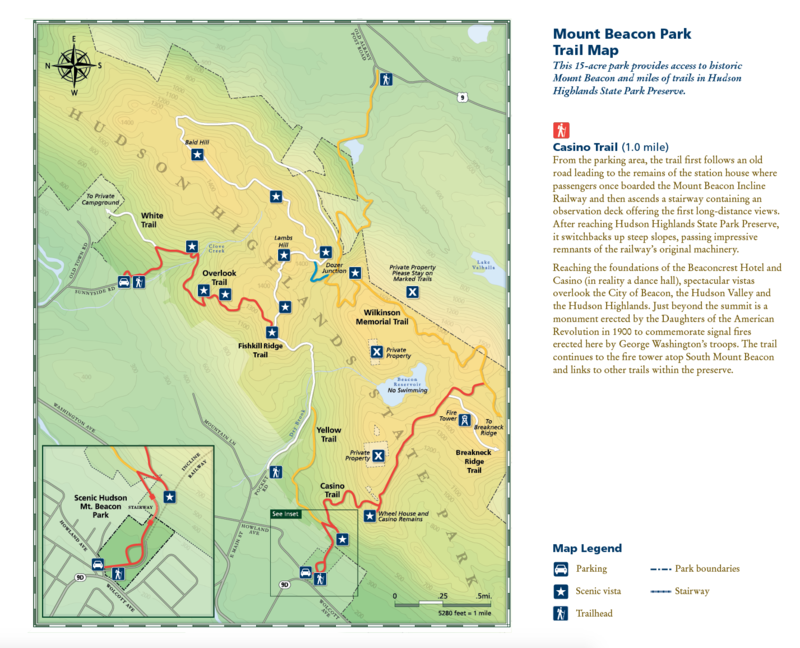 Mount Beacon is the highest peak of the Hudson Highlands which rises high above the Hudson River. The northern peak, at 1,531 feet above sea level, has a complex of radio antennas on its summit and the 1,610-foot southern summit has a fire lookout tower. It is one of the more popular destinations of hikers in the Hudson Valley area. Throngs of people (and vehicles) can be seen at the northern summit. Although the climb is steep and rocky, it rewards you with fantastic panoramic views of the area. Since it is the Fall foliage season, we started with the Bear Hill Nature Preserve – Autumn Edition hike last week and then further south this week for this hike. This is one of those Hudson Valley hikes that if you’re an avid hiker, belongs on your résumé. Since I hadn’t done this hike, and the last month or so were easy hikes, I felt it was time to take on something a bit more challenging. We began the hike at Mount Beacon Park, on Howland Avenue in the City of Beacon. The lot is a good size, but fills up rather quickly. We arrived at around 9am on a Sunday and there were only a few spots left. This is an easy hike to follow, considering that for the greater part of the hike you only have to follow the red blazes of the Casino Trail. After a short walk we came to what is left of the lower section of the Mount Beacon Incline Railway, which operated from 1902-1978, but was marred by fires throughout it’s history. It used to take passengers up 1,540 feet to where the Beaconcrest Hotel and a casino used to be. All that is left of this historical funicular is the upper powerhouse and some sections of the railbed. Immediately after passing the ruins of the railway, we were confronted with a giant metal staircase that in itself was a good cardio workout. Once we climbed the more than 200 steps, we were ready to tackle the steep climb that ensued. The trail, although pleasing to the eye, was no walk in the park. The first 1,000 feet of trail was on steep rocky switchbacks. We passed pairs and groups of people along the way and were passed by just as many. We stopped frequently to catch our breath and continued up the Casino Trail. On several sections along the trail we passed by remnants of an old ski lift. After some huffing and puffing, we arrived at the site of the ruins of Mount Beacon Incline Railway’s upper powerhouse. All that is left from a fire in 1983 is the shell of the building and the huge gears that used to haul the railcars up the side of the mountain. Well, I have to say that the steep hike up was totally worth it. The view from the north summit was spectacular. I could see the Hudson River, the Newburgh–Beacon Bridge and all the way to the Shawangunks. The view north up the river wasn’t bad either. The view to the southwest was impressive as well. Although the leaves seemed to be a little past peak, there was till some color to be found. We hung out at the casino ruins for quite some time. We basked in the sun, took in the view and had a bite to eat. Looking up at the Mount Beacon Fire Tower, it looked pretty far away. It was only about a mile and about 500 feet of elevation, but from where I was sitting it didn’t look easy. After taking a lengthy break, we headed back onto the red blazed Casino Trail for the southern summit of Mount Beacon and the fire tower. We were lucky as most people end their hike at the northern summit and don’t go much further. We only passed several people at most on our way up to the tower. It was a very attractive section of the trail that was filled with color. I knew that at some point we had to turn right onto the white blazed Breakneck Ridge trail to get to the fire tower. I never saw any white blazes, but I saw a couple descending down a steep rock face and happen to ask them if the tower was up that way. Good thing I asked, otherwise I may still be looking for it. We climbed up the steep slope of exposed rock and then we were there. What a sight for sore feet when we finally saw the fire tower reaching up towards the sky. There were quite a few people on and around the tower. We took a break and waited for the crowd to thin out a little. There appeared to be far too many people in the tower for such a windy day. The cabin at the top is only 7×7 and in one instance I counted 9 people up there, with many more at other stages. I was a little concerned that a huge gust of wind could topple the tower with so many people on it. Other fire towers that I have visited usually have a sign with the allowable occupants at one time, but this one had no sign. When the crowd subsided, we climbed the tower only to have a newly arriving crowd right behind us. We only went up a couple of levels and captured some images from there. After spending some time at the southern summit of Mount Beacon and taking in the spectacular views from the fire tower, we began our trek back down the mountain. We walked down the exposed rock of the Breakneck Ridge trail until we met up with the red blazed Casino Trail where we turned left. On the way down we saw a few ATVs and dirt bikes along with some SUVs. Apparently this must be a hangout for area youths. We also saw the remains of a vehicle that never made it back down the mountain. Upon arriving back at the casino ruins on the northern summit, I noticed a lot more people there than when we left. There were also quite a few vehicles there as well. We sat here for a short while capturing a few more images before we headed back down the Casino Trail. It was late afternoon and the trail was now teeming with hikers. We made our way back to the parking lot where we began our hike and then we were able to call it a day. Grilled steak tacos awaited us and we were famished. I hope that you enjoyed the hike and don’t forget to subscribe to my blog. Next weekend will be a Halloween edition hike. Stay tuned and don’t forget, get out there and take a hike!